It’s the bain of my existence. Or it’s a stable beginning to a day of healthy eating. Or it’s an indulgent part of a fabulous day the ends in me with chocolate stains on my shirt. It fluctuates between those three. I have to have protein with my breakfast, and so do my kids. If we have an easy cereal morning, within a few hours everyone is grumpy and hungry. The problem is, I’m not always in the mood to make eggs and my kids aren’t always in the mood for whole grain oatmeal. I need an easy pre-prepared breakfast option for crazy days and lazy days. 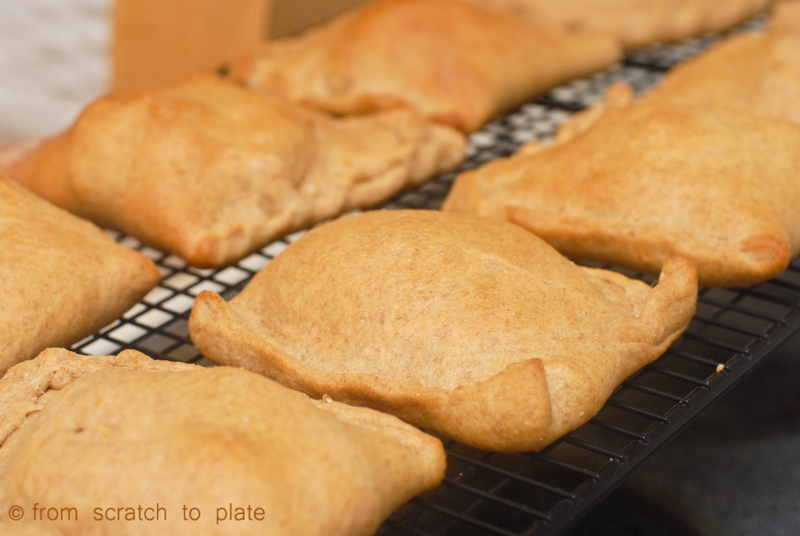 I took inspiration from frozen hot pockets, and decided to make some myself, but healthier. The crust is a super soft and flavorful honey whole wheat bread, rolled thin, so there’s no heaviness (I know what you’re thinking when you hear “whole wheat”…banish that thought). The greatest thing is how flexible the filling can be. My kids prefer eggs, sausage and cheese. You can just do eggs and cheese, or get creative with stir-fried veggies, quinoa, curried potatoes. One of our favorites is leftover sausage and gravy with scrambled eggs. The best thing? 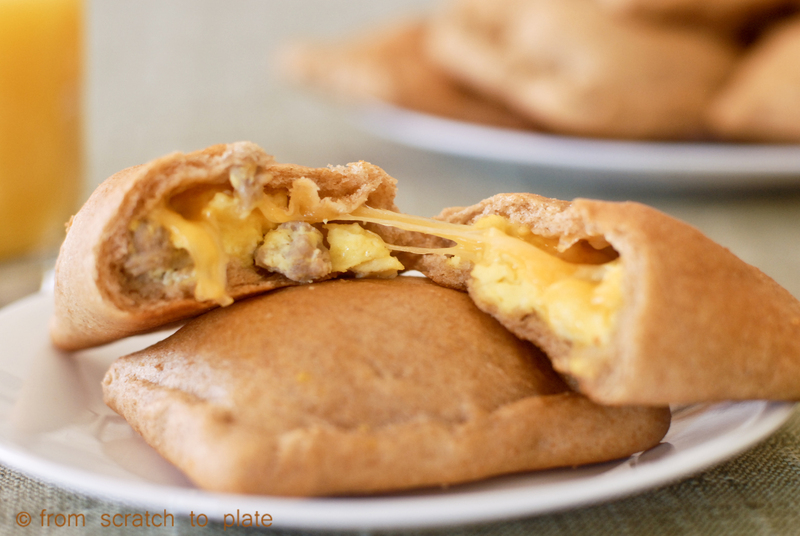 These can be frozen, then nuked in the microwave for a super simple, quick breakfast on the go, but HEALTHY!!! You’ll win the mom of the year award. Take the egg out of the fridge to bring to room temperature, whisk it in a bowl. In a mixer, with dough hook attached, stir together warm water and honey. Add yeast and let sit for 5 minutes, until frothy. Add oil, egg, 2 cups of wheat flour, gluten, dry milk and salt. Mix on low until well combined. Add 1 additional cup of flour. With mixer on low, add more flour a little as a time, as needed, until dough pulls away from the sides of the bowl and creates a ball. Your goal here is to add as little flour as possible. Let the mixer knead the dough for 5 minutes. 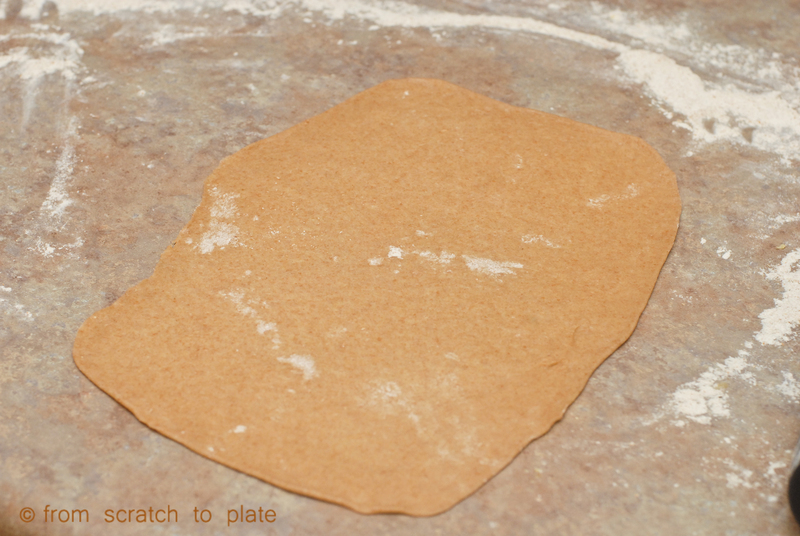 Check on it every once in a while and add small portions of flour as needed if dough sticks to the sides of the bowl. When kneading is finished, cover bowl with a towel and place in a warm spot to rise for one hour, or until double in bulk. Preheat oven to 350 degrees. 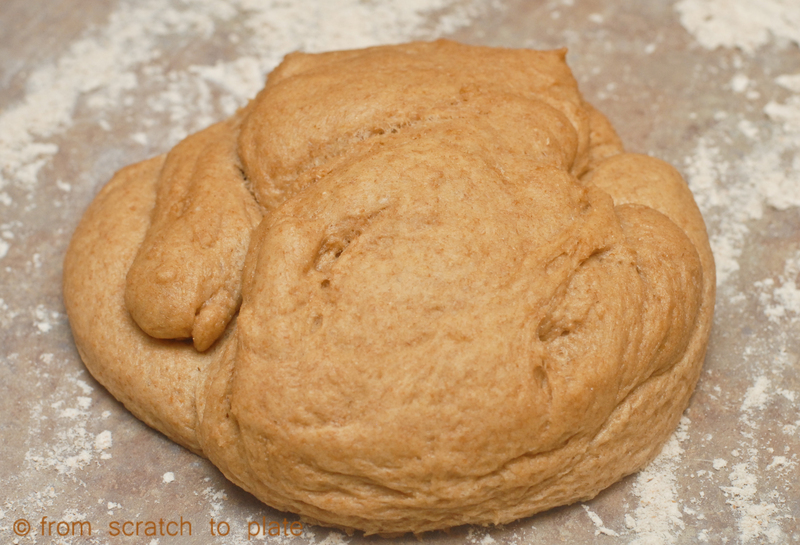 Dump dough on a lightly floured surface. Divide into 6 equal pieces. 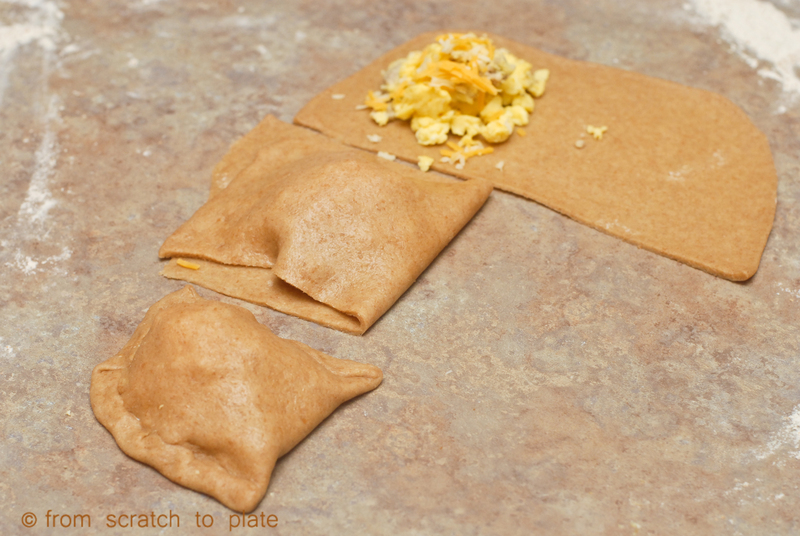 Roll out each piece into a rectangle. Roll it as thin as you can without it ripping. Cut each rectangle into 3 pieces. Place 1/3 cup of whatever filling you are using onto one side. Fold it over and pinch the edge shut (this works best if you bring the bottom up and fold it over the top before pinching. 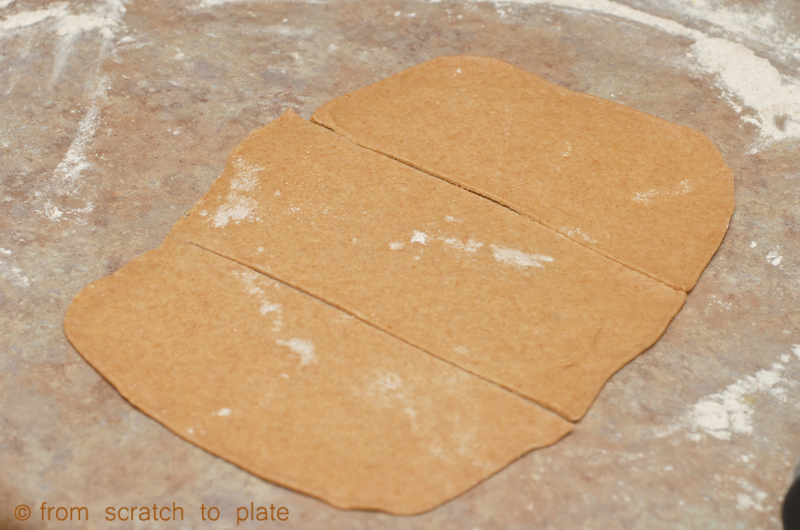 Place them on a parchment-covered baking sheet. Bake for 15 minutes, or until golden brown. Let cool before placing in freezer zipper bags and freezing. To reheat, take from freezer and microwave for 35 seconds. Brown sausage in a skillet. Drain well. Scramble eggs and cook in a skillet until cooked through, but not brown. Mix the sausage in with the eggs. 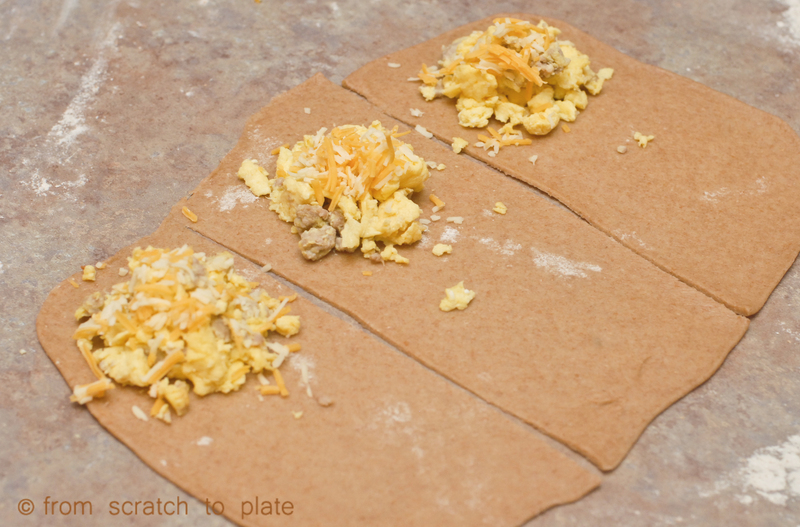 Use as a filling, topping with cheese as desired before pinching shut. REAL food alert: check your sausage for MSG, BHA and BHT. Check your pre-shredded cheese for various additives, including some that contain popular allergens (best bet: buy it and shred it yourself). Great recipe. I think I need to try these. Please tell me about vital wheat gluten and where to get it. I am not familiar with that ingredient. I think this is the best filling recipe I’ve ever seen! Simple and you just know it’s delicious! Oh my, this looks so great! I actually like making breakfast, I’m awake super early everyday anyways. But these will be for my lazy mornings ;). Thank you! These look fabulous! I bet something similar would work well for lunches too. Thanks! Definitely! I’m planning a post with various lunch fillings…look for it in the next couple of weeks. Thanks!! ooh yeah! pizza filling, ham & cheese, spinach & feta, pot pie…omg my mind is racing with ideas – they’re endless once you get the dough down! I love putting my husband’s food together for his work day (spoiled, I know 😉 ). 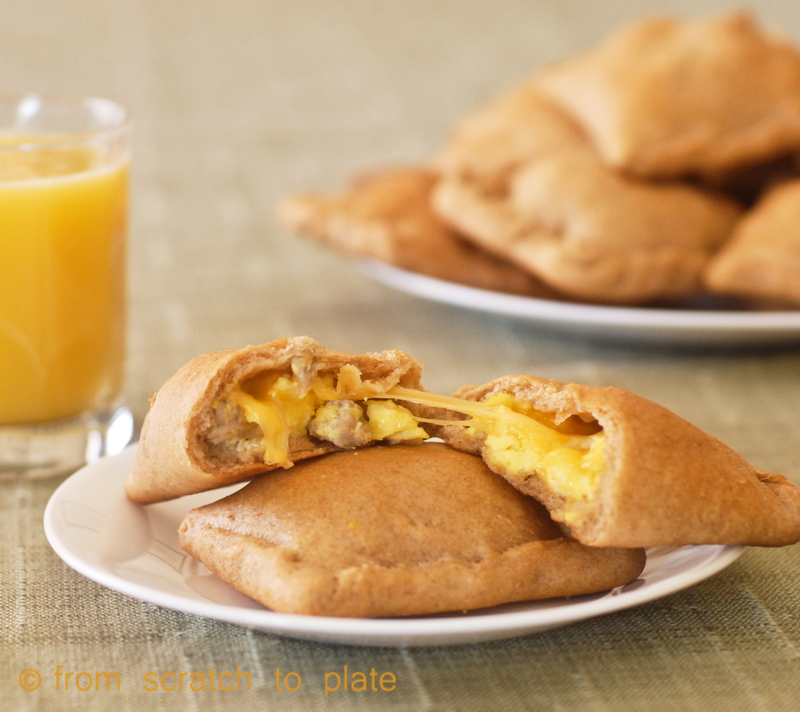 This is a great bfast for him to grab from the freezer and heat up at the office. 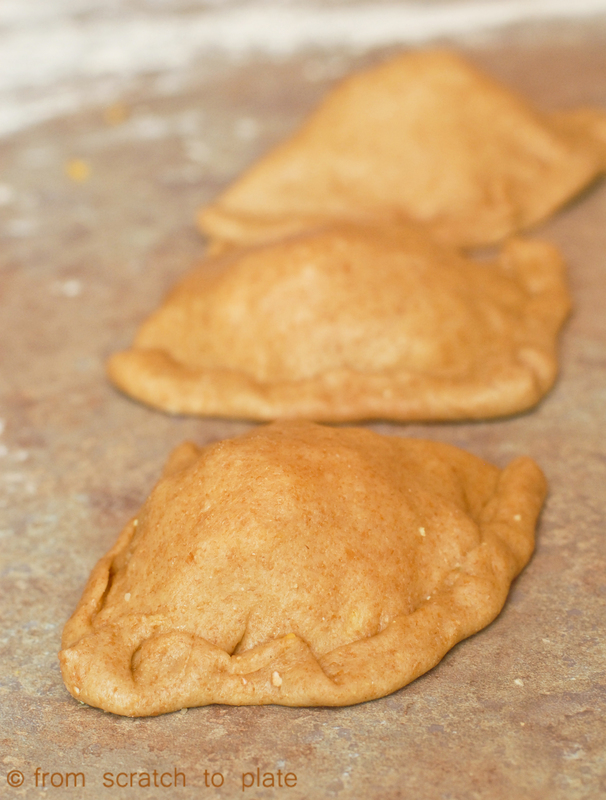 They were very time consuming – I almost considering throwing out my last 2 dough balls but kept with it. But I’ll admit, I haven’t worked with dough very much. Mine looked small but did puff up in the oven. Usually when something ends up being this much more work than I anticipated, I throw out the recipe. But I’m excited for him to try cuz if he likes them, I’ll def make again. If you take a Saturday morning and make a double batch and freeze them, it’s totally worth it. I plan to triple it, making breakfast ones and lunch ones. It saves so much money and time in the long run. I use whole wheat flour all the time. What happens if I don’t use the vital wheat gluten? You can totally skip the gluten. It helps the texture and rise, but it’ll still be good without it. I saw on here somewhere that you could do it with different ingredients. My favorite food on the planet is spinach and mushrooms. Do you think I could make a potato, spinach mushroom egg and turkey one? Or would these ingredients be bad in a freezer? I have been trying to find something quick and easy for Sunday mornings 🙂 So ridiculously excited about this!!!!!! Thanks so much!!!!! I think you should definitely try! If you grate the potatoes instead of cubing them, you may have better results. Cooked potatoes sometimes have a weird texture after freezing. Let me know how they turn out!! Can you tell me about how many these make per batch?